In the yogic tradition Hanuman is known as the monkey-god who serves Lord Ram by finding Ram's wife Sita and bringing them back into divine union. 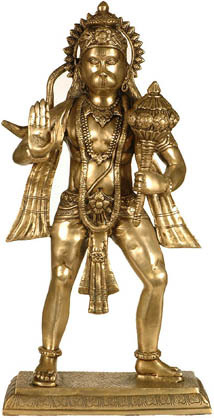 Hanuman can be seen as the conduit for bringing the masculine and feminine sides of ourselves together. He is the diety who embodies the bhakti tradition because his life is devoted service. The bhakti yogis believe that it is love that brings one into a state of samadhi (the yogic equivalent of nirvana). The bhaktas believe that love- not detachment- is the end. love is the beginning, it is the journey, it is the destination. In Bhakti Yoga, known as the path of love & devotion, we use divine mythological symbols of "deities" that represent different aspects, qualities and virtues of the Divine that we seek to awaken within ourselves. PICTURED in the center of our BHAKTI YOGA SHALA logo, you will see a playful & joyful image of "Hanuman", the divine monkey from the great bhakti yoga tradition in India. Hanuman embodies & directly represents the great virtue of "service", or "Dasya Bhakti" - which means the central spiritual quality of being a beneficial energy and presence to all Beings ... We are reminded by Hanuman-ji to selflessly serve the Divine that lives within and without all Beings and do what we can in our own unique way to uplift the collective vibration on the planet. MISSION STATEMENT | Our mission at BHAKTI YOGA SHALA: To serve YOU, to be a beneficial and uplifting energy to you in your life, on your path to love, health, and joy and peace. 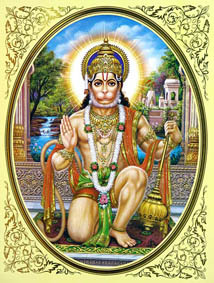 It is with great humility and appreciation that we honor the opportunity to serve you ... JAI HANUMAN!!! Centered of our BHAKTI YOGA SHALA logo, you will see a playful & joyful image of "Hanuman", the divine monkey from the great bhakti yoga tradition in India. Hanuman embodies & directly represents the great virtue of "service", or "Dasya Bhakti" - which means the central spiritual quality of being a beneficial energy and presence to all Beings ... We are reminded by Hanuman-ji to selflessly serve the Divine that lives within and without all Beings and do what we can in our own unique way to uplift the collective vibration on the planet.